Day 1, get rid of one item in your house. Day 2, get rid of two. Day 3—you get the idea. By day 30, you'll have 465 fewer things and a new perspective on your home and habits. Keep only what has a purpose and brings you joy. My niece, Libby, took on the minimalism challenge last spring. A Tulsa-based music teacher in her early 30s, Libby has lived in her 2-bedroom midtown Tulsa cottage for nearly a decade—plenty of time to accumulate "stuff" in her closets, cabinets and garage. Libby started the month uncollecting big items: end tables, lamps and such. This was all fairly straightforward until day six or seven, by which time she'd already eliminated two dozen items! She began digging through drawers and noticing things she'd long overlooked—stacks of old magazines, socks with holes in them, college notebooks she'd moved several times but never opened. Anything she felt attached to, she photographed—for instance, a list of top 10 tips for music majors. Libby told me she still remembered the day a professor had handed it out. Still, she knew it was time to move on. "A: I’m not a music major anymore—I’ve been working for 10 years," Libby said. "B: I hadn’t looked at it since I moved into my house in 2008. C: I don’t need it. It’s just taking up space on a bookcase that could have been aesthetically pleasing but was just packed full of crap. Libby knew she wouldn’t have time some days to find 16 or 19 or 27 items to purge. Instead, she worked ahead and kept track with a checklist. PRO TIP: Libby wisely let go of anything she'd been keeping just in case she needed it someday—and she hasn't missed a thing! This includes all clothing that didn’t fit. "I have clothes in a million different sizes," she said. "I decided to only keep things that I actually like to wear now, not things I might wear someday if I’m feeling more adventurous, or if I’m feeling more conservative. I’d rather not have my day-to-day life cluttered with the idea that I might someday." Libby surprised herself with how many sentimental belongings she managed to unhand. In her garage, she found a bag of things from a certain era of her childhood bedroom. She remembered each item, and it all felt like a part of her identity. But she knew it wasn't, and she tossed the whole bag! Getting rid of things can feel hard at first, but it ultimately feels liberating. Libby said she began to see her home in a new way. "Once I got on a roll and cleared out one area and put things back in a really nice way, I began noticing how much I enjoyed those clean areas," Libby said. "I hadn't even realized that some spaces were really crowded. Now, every time I walk by them, I'm happy." Libby said this process made all of her spaces more beautiful—even areas she didn't think needed to be beautiful! "I didn’t know that I could appreciate my junk drawer," she said. "When I opened it up, there were just scissors and tape and maybe two other things. Or in my garage, a neat box for adhesives, with exactly what I needed, not a million duplicates or a dumping ground for everything. I really appreciated all the spaces in my house." Can't stand to toss all those office supplies in your junk drawer? Donate them to a local school to offset costs for parents and teachers. Read more tips for uncollecting here. "I was like, 'This is so great! I want to be in my closet!' Before, it was a scary place, and I didn't want to know what was happening in there." Thanks for sharing your story, Libby! 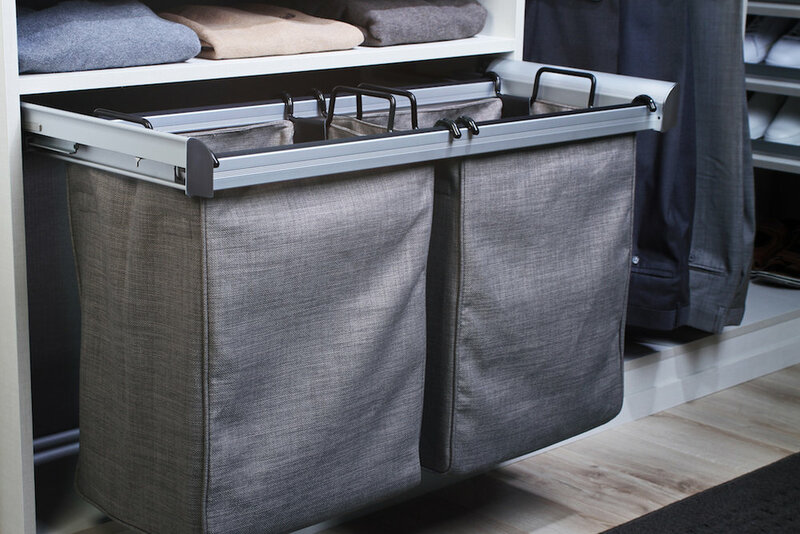 Make the most of your month of minimalism with custom closets that keep you on track! Call Closets of Tulsa today for your FREE consultation and 3-D closet design.